So you've entered the Summer Fun Giveaway, and now it's time to enter the Grand Prize Giveaway! How exciting is that?! Two opportunities to win amazing packages. 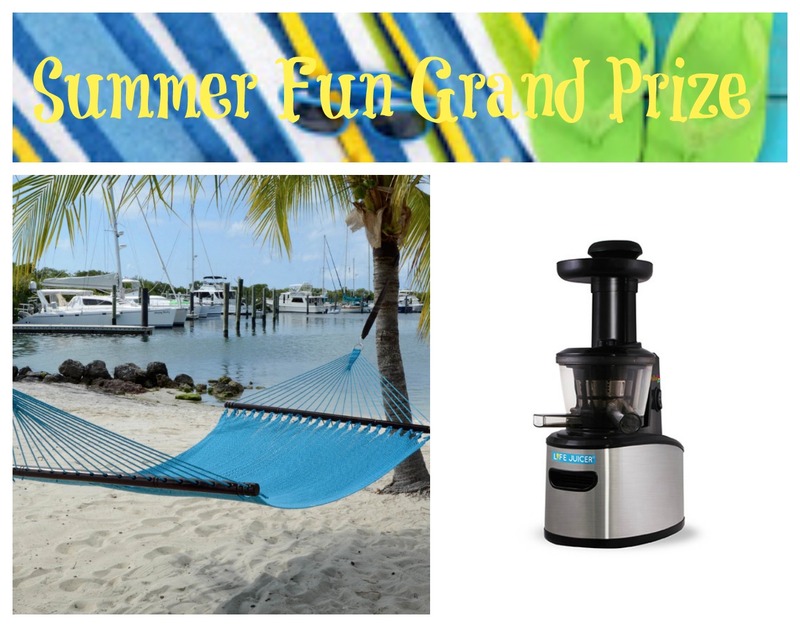 This Grand Prize consists of a DFOhome Caribbean Hammock and Viatek Life Juicer! The RV of the Grand Prize is $345!! Once you've finished entering these prizes be sure to enter through all of the bloggers below. I was provided a hammock from DFOhome and juicer from Viatek for review! Woven by Words and the other bloggers are not responsible for prize fulfillment. I like the PEARL HAIR REMOVER PRO and the HAIRPRO LUXOR LASER HAIR TREATMENT from viatek. I like the aruba blue, sunshine yellow, and the plum purple hammock. I really love the CLEAN SPIN SOLO OCTAGONAL SPIN MOP from Viatek. I think it would make my mopping jobs easier. And at DFOhome I would choose the Sunset Orange hammock, I think it's really bright and pretty. Thank you. I love the Mighty jump from Viatek and I like the hammock in Plum Purple. I would like the Fitnation Flex Core 8 for my daughter. She is really into the exercise program for this summer and this looks like it would be what she would need and like. I like the Plum Purple color for the hammock!! I really would love to try the Spin Mop. I have wooden floors and I think this would work well. I love the Pocket Mighty Jump 10,000mAh Smart Charger from Viatek and the blue hammock is my favorite. I really like the Orbie Silicone Ice Molds - how cool would round ice be? The mocha colored hammock would be best for our crazy family even though I love the sunset orange best. From Viatek, I also like the Bob Vila pruning tool. From DFO Home, I like the forest green hammock. Wow this is a amazing giveaway!! I love the hammocks, I would most likely choose the purple, I did not see pink, but they are all so nice it is hard to choose. Far as the other products I would like, wow hard choice I like so many!! The spin mop would be very handy. I also like the ab thing. And many more items. Thank you for the amazing giveaway and hop. I like the BodiPro 3-in-1 Personal Care and I would go with forest green. I love the night start landscaping lights from Viatek and the color of the hammock that i like is aruba blue. I like the Wonder Forts - Ultimate Fort Building Kit from Viatek. The color hammock I like is Aruba Blue! I like the FITNATION FLEX CORE 8 from Viatek and I like the plum purple hammock. I would also love to try a GumDrops Tricolor Nightlight & Flashlight from Viatek, these would be perfect for my kids! :) I would pick the hammock in the Forest Green color if I won, it looks so relaxing! I like the PORTABLE SEARCH LIGHT - 2 PACK from Viatek and I love the Sunshine Yellow hammock. I would absolutely love to have the Sandy Tan Hammock. This would be so great to tie up and just relax on. I would also love to have the Frutti Freeze. My daughter would be in heaven if we had that as she is the queen of fruit and smoothies and ice cream. I like the Bob Vila Workman's Tool Bag, and I would choose the Sandy Tan colored hammock! From Viatech I really like the Viatek Consumer Products Group, Inc Micro Greenhouse it would be nice for starting plants. From DFOHome I really like their Aruba Blue hammock because it is so pretty. I like the Fitnation Flex Core 8 on Viatech. I would choose the dark blue hammock. I would Love the Mosquito Trap, here in Birmingham, AL the bugs are going nutso. I would love hammock in Mocha would be Terrific!! !